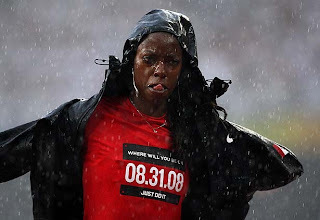 Nicole Forrester - The Olympian Blog: "Will we be seeing you in London 2012?" "Will we be seeing you in London 2012?" Well, it’s been a while since my last blog. I’ve just returned home from Europe and I am still trying to catch up with some left behind work. This time of the year can be challenging for me. It requires an adjustment, after being away from home for 4 months and trying to settle into normal daily activities. And unlike New Year’s, this time of the year usually conjures up many life questions. Athletically, the past season is reviewed and plans for the following year are thought through. However, this year I’ve also had to consider whether I will continue the high jump for another 4 year. In fact, it seems to be a question many people ask me. In fact, I think that might have been the first question asked to me as I stepped off the track in the Bird’s Nest. In the end I realized it was the emotional investment that another 4 years would demand, that seemed to make me indecisive. Additionally, I have other facets of life available to tempt me away from my passion for the high jump. By emotional investment I mean believing in the unseen, with no guarantee in place and the unplanned expectancies of life. For me my ankle sprained 3 days before the qualification rounds at the Olympic Games proves this. But, isn’t that what life is about? And isn’t it the journey that makes victory sweeter? So, in these weeks following my last competition I’ve taken time to consider this question; and I realized that the only answer that is true to the type of person I am is “Yes”! Yes, I am committing to another 4 year cycle of Athletics.